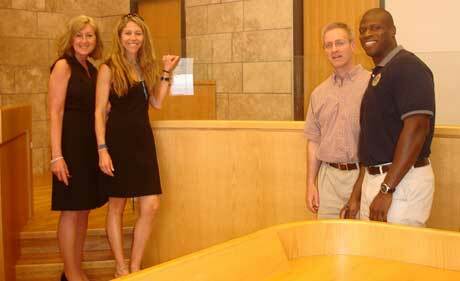 Four Bergen County assistant prosecutors recently returned from a 10-day crash course on criminal justice in Israel. To their surprise, they found major differences between the legal procedures of the two democracies. Last September, Molinelli and Assistant Prosecutor Vered Adoni attended a breakfast session summing up the latest round in the UJA of Northern New Jersey’s Partnership 2000 professional exchange program for emergency services personnel from Bergen County and the federation’s Israeli partner city of Nahariya. According to Partnership 2000 Coordinator Machla Shaffer, the program allows law-enforcement personnel to learn how each country deals with specific threats such as terrorism. Impressed by this information exchange, Molinelli asked Haifa native Adoni to coordinate a similar program for assistant prosecutors. With Shaffer’s assistance, Adoni drew up an itinerary touching on academic, judicial, and legislative perspectives on Israel’s criminal justice system “from the moment a crime is committed to when an appeal takes place,” as Adoni put it. She served as the group’s translator when necessary. Adoni had emigrated from Israel with her family at 15, returning to fulfill her military service before graduating from Montclair State University and Yeshiva University’s Benjamin N. Cardozo School of Law. She therefore had just as much to learn as did her colleagues Catherine Fantuzzi, Thomas Kearney, and Ron McCormick. By the end of the April 29-May 8 trip, they had accumulated “pages upon pages of information” to share with the other assistant prosecutors. “I’m sure they will be fascinated by the differences between the two legal systems. Sometimes you think your system is the only one that works,” Adoni said. Later this year, she hopes to host the first group of Israeli prosecutors in Hackensack. One of their first stops was the northern mixed Arab-Jewish city of Nazareth, where Deputy Prosecutor Shalva Levine and her staff provided a primer on Israeli criminal law. The visitors discovered that Israeli prosecutors wield considerable power. Indeed, the very idea of trial by jury is unknown in Israel, where judges are both fact-finders and finders of law. Tel Aviv District Court President Devorah Berliner and several of her judges expressed skeptical curiosity about the jury system to Adoni’s group. Another critical procedural difference is that Israeli prosecutors are permitted to argue that a defendant’s silence is indicative of guilt. They were equally surprised to learn that Israeli law provides no minimum sentencing guidelines. “Israeli judges can impose any jail time they want as long as they don’t go past the maximum,” Adoni said. David Rotem, chairman of the Knesset’s Constitution, Law, and Justice Committee, told the Bergen visitors that he is looking into imposing minimum sentencing guidelines, but faces opposition from judges and defense attorneys. That point was reinforced during a meeting with public defenders, where the Bergen prosecutors also learned that even wealthy Israelis can qualify for free legal representation if they meet certain criteria. In the United States, indigence is the sole qualifying factor. Another difference is that whereas the U.S. Supreme Court annually chooses a small fraction of cases to hear, the Israeli Supreme Court is required to consider every one of the thousands of cases brought before it – leading to a huge caseload and corresponding backlog. This situation makes for “a very busy appellate role” for state’s attorneys, said Adoni. Turning to law enforcement, Hebrew University Prof. Badi Hasisi gave the prosecutors an overview of the relationship between different groups of Israelis and the police. Hasisi revealed data showing that Jewish attitudes toward police in Judea and Samaria deteriorated greatly after the 2005 disengagement from Gaza and a subsequent violent eviction of settlers in Amona, while Arab-Israeli attitudes toward police had soured during the intifada just a few years before. Hasisi also shared his research suggesting that fighting terror detracts from the police’s ability to address common crime in Jewish areas, while in Arab areas extra precautions such as roadblocks actually enhance police effectiveness. “This tells us something about moving resources to deal with terror’s byproducts,” said Hasisi, who recently published these findings in a British law-enforcement journal.